A consistently rolling reality production generates a lot of content, sometimes recording multiple angles 24 hours a day, seven days a week, for several weeks straight. The same can be said for varying broadcast applications, from live production to news. Today's reality TV productions are ambitious in their size and tight broadcast schedules, requiring a multitude of impressive engineering feats. When not tracking every move of a housewife, psychic medium or celebrity, other competition-based shows closely follow the progress of contestants. For these competition type shows, the footage is broken up into segments: the documentary portions that provide a backstory of each of the contestants, the behind-the-scenes shots show the competition prep, and the (sometimes live, sometimes not) actual competition portion itself. The production teams involved with compiling the footage and putting it all together understand that these programs generate hundreds, sometimes thousands of assets that need to be managed and accessible at a moment's notice. Working on a high-profile reality show is a major undertaking. For several international- and domestic-based reality shows, media asset management systems, such as Pronology's CenterPoint¢, has managed, organized and archived more than 12,000 hours of footage and more than one million metadata entries throughout a single season of a given reality show. Asset management makes it possible to efficiently capture, edit, organize and archive those 12,000-plus hours of footage that accumulate throughout the course of the production. With cameras rolling 24/7, production can control the locations of where content is captured, especially when dealing with an in-house-style production where the movements of the contestants are unpredictable, by cameras and microphones that are strategically placed in the filming locations, which ensures the content is coming from the same pre-determined sources. Reality TV's pace is just as fast as news but production crews typically know when outside footage is coming in so they can properly plan and prepare. When working in a news environment, the settings are fast-paced and content heavy, where teams - editors, directors and producers - work in bustling environments where they need to be able to find, preview, edit and format digital content quickly. Archiving a studio's media assets with a media asset management (MAM) system, allows media and broadcast outlets to manage large depots of assets and quickly search and recover relevant content. News applications have a need for script, scheduling and picture integration in a more automated fashion than most reality programs. A MAM system that allows for the automation of everyday newsroom tasks, which includes receiving content from different locations and languages on a global scale, results in a larger variety of content. Just as with reality production, there are often various segments from in-studio commentary to on-location shots and then back to studio. The unpredictability aspect for news lies in the on-location shot, especially when working with a breaking news story. This is not a controlled environment and typically does not allow for much prep. Having an established media asset management system that can manage content from multiple locations is essential for a news station. With today's global production environment, location can be a challenge for any type of production when there are multiple shooting and editing locations. To give producers and editors instant access to the media needed, a MAM system that offers location intelligence of its content is a major benefit. A complete and easy-to-use MAM solution that can be catered to your specific production type is an invaluable tool on set and in the editing room. 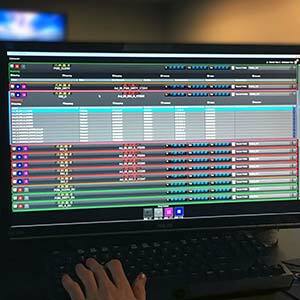 A fully integrated system that could acquire, manage, approve, log, distribute, transcode and archive all media assets with 100 percent uptime can be your greatest asset for your production or newsroom.